1 - Mark Wheeler provided article, no date. And my our courage always be. And May our colors always wave. Here’s to the Cardinal and the white. On July 1st, 1948, ground was broken for the new Norris City High School building. The facility included a 450-seat auditorium and a gymnasium with a capacity for 3,500 people. Eighth through twelfth grades are housed at the new high school building. 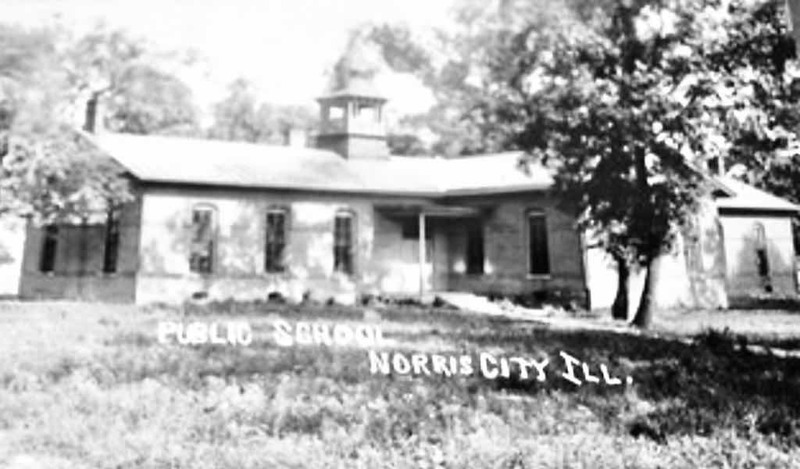 In 1949, Norris City Community Unit Number 3 High School was created by merging 19 rural one-room schools with the Norris City School System. In 1953, Omaha High School joined Norris City forming the Norris City-Omaha (NCO) Community Unit Number 3 High School. Ralph Legeman of Evansville, IN designed the new high school at Norris City including a gym that was first of its kind in southern Illinois. Both the playing floor (70' x 110') and nine rows of bleachers were below ground. Spectators entered the building at the top bleacher. The roof was supported by steel trusses bent at an angle. Mr. Legeman designed 27 other gymnasiums and licensed 10 more including Evansville's Roberts Stadium. In 1953, Omaha High School in Gallatin County consolidated into Norris City-Omaha (NCO) Community Unit Number 3 High School.